For 26-year-old office worker Lee Hye-ri, it seems like a far-fetched dream to exercise and enjoy her hobbies after work every day. It is quite difficult to imagine life outside her workplace as she works as late as 11 p.m. The newcomer, who was employed by a state-run company last year, often works overtime and sometimes works at home on weekends. She dozes off on the bus while commuting and sleeps a lot on weekends to fight a chronic lack of sleep. Lee is one of many Korean workers who suffer from chronically long working hours in a society where overtime work is seen as a symbol of diligence. According to a 2014 survey by the Labor Ministry on 1,300 workers on Korea’s work culture, only 26.5 percent of laborers left work on time five days a week. Among those who could not leave the office in time, 35.1 percent cited the nature of their job as the reason behind their long working hours, followed by company culture taking overtime work for granted at 25.8 percent and low productivity during working hours at 20.9 percent. Some 10 percent of them could not leave work because they felt pressured, while 6.4 percent cited a heavy workload. 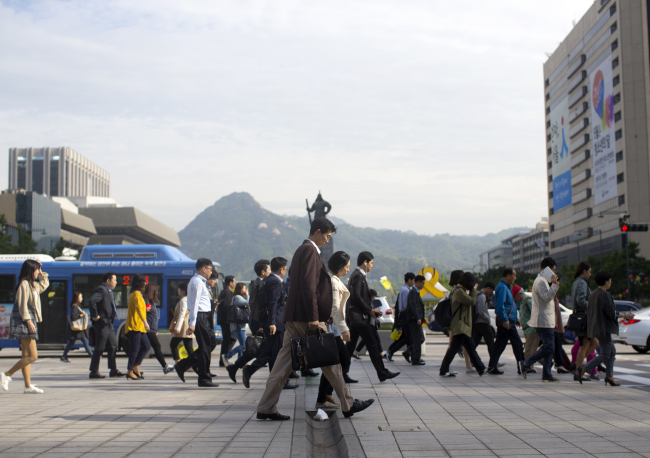 South Koreans including salaried employees, self-employed and part-timers worked 2,124 hours in 2014, the second-longest hours among Organization for Economic Co-operation and Development countries, according to OECD statistics. It marks 354 hours longer than the average for OECD countries, which stands at 1,770 hours per year. To root out the practice of working long hours in Korea, Rep. Lee Chan-yeol of The Minjoo Party of Korea submitted a package of revisions to the existing labor acts to reduce working hours, on May 30 upon the opening of the 20th National Assembly. The bill -- dubbed the “kal-twegeun bill, referring to leaving on time from work -- includes imposing financial penalties on companies who violate legally-mandated working hours and making it mandatory for companies to record when workers come to work and leave work. The long working hours cause health problems for laborers, which is linked to low labor productivity, the level of output for every hour of work, an expert said. “Many studies have shown that laborers working more than 50 hours a week are more likely to be exposed to work-related accidents and cardiovascular diseases because they grow more stressed and fatigued,” said Lee Hye-eun, a professor for occupational and environmental medicine at Catholic University of Korea. According to the OECD data, South Koreans’ labor productivity, GDP per hour worked, was $31.2 per hour in 2014, much lower than the OECD average of $45.9. It is a stark comparison with Germany, where laborers worked for 1,371 hours per year, but with productivity scores of $58.9 per hour. Behind the culture of working overtime, Kim Jong-jin, a researcher from the Korea Labor & Society Institute, pointed to a social structure exploiting laborers for low wage. Park Hye-young, a labor attorney for the nongovernmental group Solidarity for Workers’ Health, cited the country’s rapid industrialization and economic growth. Park views the bill as a crucial step to trigger the public debate on long working hours in Korea, but questions remain on whether it can be properly enforced. “Even the legally-binding minimum wage is not respected at all the workplaces in Korea despite existence of the relevant act,” she said, addressing the need for the government’s “will” to slash working hours for Koreans.